Travel to Mexico, without leaving your home, thanks to The Games Company latest video slot, Mariachi Mayhem, which offers players big wins and plenty of fun. The four mariachis greet you with their great big sombrero hats and musical instruments, but that’s not all. This slot features expanding wilds, free spins, stepping colossal, as well as four great features that are launched by the mariachis themselves. 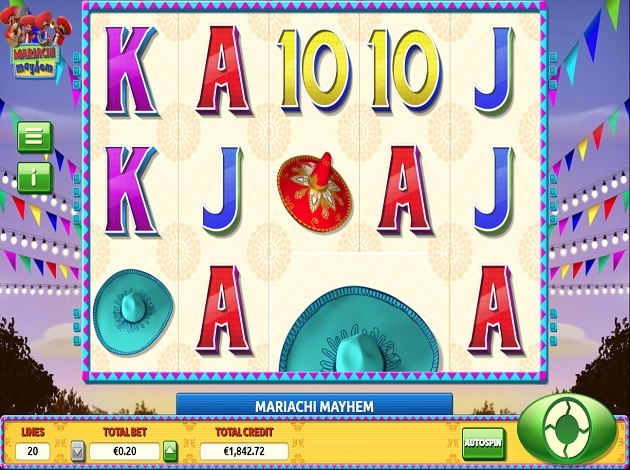 Mariachi Mayhem is a 5x3 grid slot, with 20 paylines across the reels, and can be played from all devices. Not only is Mariachi Mayhem filled with bright, bold colours, and a good amount of Mexican madness, it’s also got some truly exciting game features. From Wild reels to Mariachi repsins, as well as some unique features such as Colossal symbols and Stepping colossal, this online video slot has it all! While the symbols on the reels usually appear at a normal size, with the Colossal symbol feature, symbols on the reels can appear much larger than usual and can expand to fill from 4 to 9 tiles on the reels, giving players a better opportunity of winning big. The Free Spins feature is triggered when 3 or more Scatter symbols appear on the reels. With the Mariachi re-spin, the four cheerful band members can randomly show up on the reels to give out some great features, including the Mariachi re-psin. When any of the four band members shows up, any colossal symbol that is currently on the reels receives a re-spin, and any wins are added up at the end of the spin. Players will be happy to hear that those four crazy band members have got more surprises waiting to be revealed, and their next feature is the Wild reels. When their happy smiling faces appear on the screen, the band members can expand a wild so that it fills an entire reel with wilds anywhere on the grid, and may even in some cases expand to fill more than one reel! This is a truly impressive feature and one to look out for. If you thought the band had no more features to give out than you are very much mistaken, as the Stepping colossal is next on the list, and this unique feature is sure to make you throw your sombrero hat in the air with excitement. With their guitars, violin, trumpet and the rest of their instruments, the band appears and makes any colossal symbols on the grid move over one step to the left across the reels. The tiles that are then left empty are filled up with wilds until the big symbols reach the leftmost reel. Any wins gained from this special move are added to the total making some great wins within reach. Like most other slots, Mariachi Mayhem has got high value and low value symbols included on the reels. The low value symbols are made up of the 9, 10, J, Q, K, and the Ace, with 9 being the lowest value symbol, offering out 50 coins for every 5 symbols, with the Ace being the highest of the low value symbols offering 150 for every 5 symbols. The highest value symbols on the other hand, are represented by brightly coloured sombrero hats. The lowest of these is the turquoise blue hat, giving out a maximum of 200 coins for 5 appearances of this symbol. The deep blue coloured hat pays out 250 coins for every 5 symbols. Next, we have the red and gold hat, with 300 coins for every 5 symbols. The top paying symbol is represented by an ornate golden hat, offering a whopping 500 coins for every 5 appearances of that symbol. Mariachi Mayhem also has Wild and Scatter symbols which can be put to good use in the game. Land a Wild symbol and this will substitute for all other symbols except for the Scatter. You will recognise the Wild with its bright blue lettering. The Scatter symbol is represented by two crossed maracas and landing 3 or more Scatter symbols will trigger the Free Spins feature. Bright colours, colourful flags, and lively music is what you will find in Mariachi Mayhem. The whole game gives off a very optimistic and cheerful atmosphere, and the background depicts a beautiful sky at dusk adorned with banners of waving flags in many different colours. The reels themselves are also full of activity, with a cheerful purple and blue frame surrounding the equally colourful symbols. The four band members make the gameplay amusing, as you cannot help but smile at their cheery dispositions. The graphics used in this game are top-notch and allows for smooth and easy gameplay. All in all Mariachi Mayhem is a great, fun game to play for any player looking for a simple but rewarding video slot. While the gameplay is not overly complicated and is easily understood by even beginner players, the bet range allows many different types of players to try a spin, and the game has enough great features to keep you interested in the game. Mariachi Mayhem also includes some unique special features, such as the Colossal symbols and the Stepping Colossal, which not only makes the game fun and exciting for players, but also provides some great opportunities to win big and earn some great rewards. So don’t wait a minute longer, get your sombrero on and get ready for some great wins.